Monte Markham played two characters on this ABC sitcom about a prospector frozen in a glacier in 1900 and later thawed out in 1967. Arthur O’Connell co-starred. It ran for 26 episodes during the 1967-1968 season. The 1960s saw television offer viewers numerous sitcoms with fantastical elements, from My Favorite Martian and The Patty Duke Show to Bewitched and The Munsters. 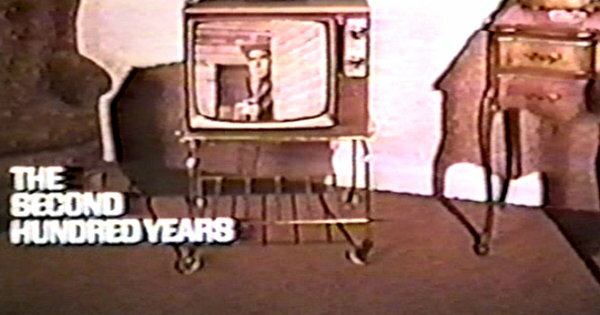 In the fall of 1967, ABC debuted two more: The Flying Nun and The Second Hundred Years. Screen Gems produced both shows, with Harry Ackerman serving as executive producer. Ed Simmons developed The Second Hundred Years based on an idea by Roswell Rogers. Rogers came up with the concept after reading an article in a Los Angeles newspaper . Screen Gems sold the series to ABC. It was given the 8:30-9PM ET time slot on Wednesdays when the network released its 1967-1968 schedule in April 1967 . The gimmick of The Second Hundred Years asked viewers to accept the possibility that a man could be frozen in a glacier for decades and then brought back to life. Such was the fate of Lucius “Luke” Carpenter, a 33-year-old prospector who disappeared while hunting gold in Fairbanks, Alaska in 1900. According to rumor, Luke was frozen in a glacier. His son Edwin was born shortly thereafter. More than six decades later, the United States military finds Luke and thaws him out. Edwin is now 67 and has a 33-year-old son named Ken. When Luke moves in, chronologically 101 but physically the same age as his grandson, their lives are turned upside down. The Pentagon wants to study Luke to determine how he survived being frozen and thawed out. He’s allowed to live with Edwin and Ken but his existence has to be kept a secret. Monte Markham played both Luke and Ken. Arthur O’Connor co-starred as Edwin. Frank Maxwell had a recurring role as Colonel Garroway, the military liaison in charge of supervising Luke. In the series premiere, Ken is planning to put his father in senior housing until Luke shows up. Ken then begins worrying about his grandfather not being able to adapt to 1967. Luke overhears and decides to leave. Edwin tracks Ken down at the train stage and convinces him to stick around, offering to help teach his father the “language” of the year 1967. “You know, I might just get to enjoy it,” Luke says, after seeing a pretty young woman walk by wearing a miniskirt. But Luke doesn’t understand the modern world. He’s also often mistaken for his grandson. Sometimes, he intentionally impersonates Ken. But while the two may look identical, they’re actually nothing alike. Ken is conservative and restrained, Luke is fun-loving and outgoing. Ken can barely speak around women, Luke is something of a ladies man. Plots ranged from silly to ridiculous: Luke gets into trouble when he decides to raise goats; a psychological test indicates Luke will make a good stagecoach driver or a Buffalo scout; Luke plays Santa Claus at a department store; Luke proposes to Colonel Garroway’s daughter Marcia (played by Karen Black) when the two have to spend the night in a construction shed; after being accused of burglary, Luke represents himself in court; Luke helps a boy save his favorite tree from the Department of Sanitation; Luke helps an elderly couple in their fight to save their house from the mayor; Colonel Galloway worries about Luke’s pretty Russian friend. Several episodes dealt with matters from Luke’s past. In one episode, he tries to help restore the reputation of the man who saved his life during the Battle of San Juan Hill. In another, Luke and an old prospecting friend’s widow learn they may own a valuable hotel. George Gent, writing for The New York Times, liked the debut episode of The Second Hundred Years. “The program got a big lift from its principals,” he said, “who brought just the right note of incredulity to the tall tale.” He praised producer Bob Claver for keeping the episode from becoming too absurd. “If he can maintain the program at the same key, future installments should be worth watching” . The premiere of The Second Hundred Years on Wednesday, September 6th performed well for ABC. It received a 47.2% Trendex share, handily beating the season premiere of The Beverly Hillbillies on CBS (22.2% share) and the last half-hour of a repeat of The Virginian on NBC (18.5% share) . The Beverly Hillbillies averaged a 30.6% share, The Second Hundred Years a 30.4% share, and The Virginian a 30.1% share . The debut episode of The Second Hundred Years landed in the Top 10 when the first weekly Nielsen report of the season was published . The series fell to 34th the following week . When Nielsen released its fifth weekly report (covering October 2nd through 8th), The Second Hundred Years was one of 14 new TV shows among the 24 lowest-rated programs on the air . Based on national Nielsen ratings for October, November, and December 1967, The Second Hundred Years averaged a 15.1 rating, which placed the series third in its time slot . ABC announced in February 1968 it planned to move The Second Hundred Years to the 7:30-8PM ET time slot on Thursdays beginning March 21st . Only a few weeks later, Broadcasting reported that the series was one of seven ABC would cancel at the end of the 1967-1968 season . Only two new episodes aired on Thursdays before ABC began airing repeats of The Second Hundred Years on April 4th. Repeats continued through September 19th. The following week, a new sitcom called The Ugliest Girl in Town took over the 7:30-8PM ET time slot on Thursday. ABC replaced the repeat scheduled for Thursday, June 6th after the assassination of Senator Robert F. Kennedy the previous day . The network apparently felt it would be inappropriate to rebroadcast “A Couple of Sad Dads” (first aired in November 1967) because it involved Luke and Edwin mistakenly believing the other had only months to live. It also feature scenes at a funeral home. Cable channel USA Network aired repeats of The Second Hundred Years from January to December 1986; from March to May 1987; and finally from September 1987 to February 1988. Screen Gems also offered the series to local stations as part of a syndicated package called “The Magic Show” consisting of Mr. Merlin, Jennifer Slept Here, The Girl with Something Extra, The Second Hundred Years, and Tabitha. Between the five shows, a total of 95 half-hour episodes were available for weekly stripping or checkerboarding. 1 Penton, Edgar. “‘Second Hundred Years’ TV Comedy Plot Came from Newspaper Clipping.” The Record Newspapers [Troy, NY]. Newspaper Enterprise Association. 30 Sep. 1967: B-9. 2 Gent, George. “A.B.C. Programs for Fall Listed. 3 Apr. 1967: 67. 3 Gent, George. “TV: ‘The Second 100 Years’ on A.B.C.” New York Times. 7 Sep. 1967: 69. 4 “Critics vs. new TV season.” Broadcasting. 11 Sep. 1967: 46. 5 Gould, Jack. “The New Old Season.” New York Times. 17 Sep. 1967: D27. 6 “CBS, ABC race into the season.” Broadcasting. 11 Sep. 1967: 45. 7 “Specials confuse ratings in second week.” Broadcasting. 18 Sep. 1967: 77. 8 “Few of TV’s virgin shows look like hits.” Broadcasting. 25 Sep. 1967: 70. 9 “New shows get no brass rings.” Broadcasting. 2 Oct. 1967: 60. 10 “Four movies in new top-10 list.” Broadcasting. 23 Oct. 1967: 42. 11 Spencer, Walter. “A crazy, mixed-up television season.” Television Magazine. Mar. 1968: 54. 12 “‘Batman’s’ TV Spot Going to ‘Second Hundred Years’.” New York Times. 14 Feb. 1968: 95. 13 “Networks start race for sales.” Broadcasting. 26 Feb. 1968: 23. 14 Gent, George. “Broad TV and Radio Coverage Planned for Kennedy Rites.” New York Times. 7 Jun. 1968: 79. Monte Markham was a guest in October on http://www.stusshow.com , which is an Internet radio show where Stu Shostak interviews people involved in classic tv and other media. The show begins was a clip from THE SECOND HUNDRED YEARS, then Mr. Markham discusses this show and most of his other experiences in acting and producing. The show is available for download now in the archive section of the website. It reminds me of the premise used on Second Chance where a resurrected father is about the same physical age as his son and Forever where an immortal man has a physically older adopted son. So the concept hasn’t gone away even though it’s not used all that often. I can still remember watching this one night in 1968 (I remember it was a rerun) when ABC broke in with the announcement that Martin Luther King had been shot. The show which replaced Batman on ABC in mid-March 1968 upon its demise.